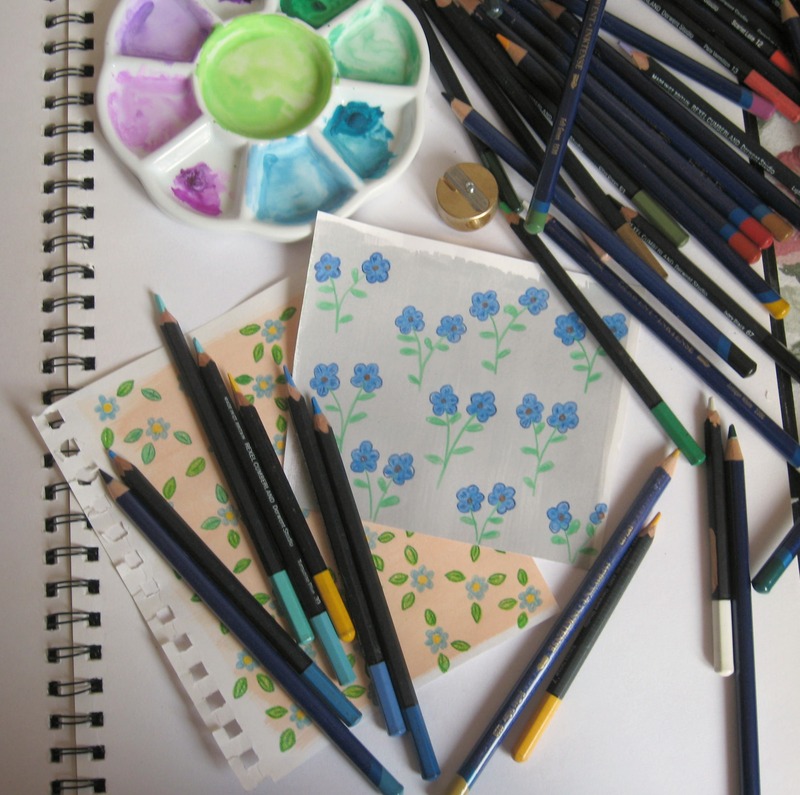 Painting the sky with stars…….. 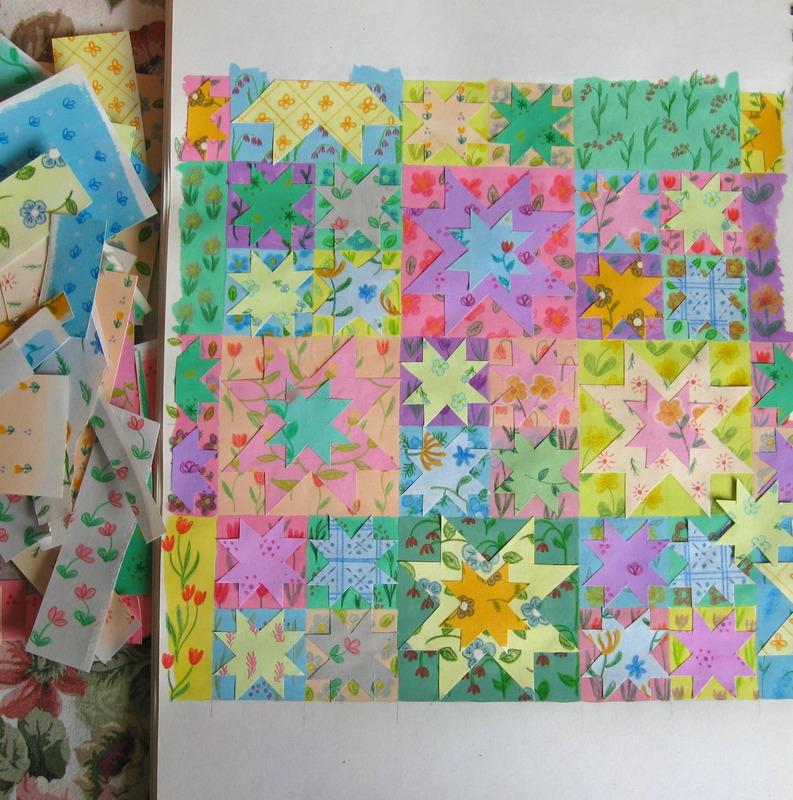 When I was deciding on the patchwork designs for the twin’s quilts I kept coming back to this arrangement of different sized stars…..however I soon realized that it wasn’t going to look quite right at the small scale I’m currently working in (the baby quilts will be about 30 inches by 42) …trying to cram too much in I think will just look a bit messy and somewhat overwhelming…..but I didn’t want to give up on the design completely and thought it would be interesting to play around with it a bit more and use some up some of the painted paper scraps that were still scattered around my work table and studio floor…. 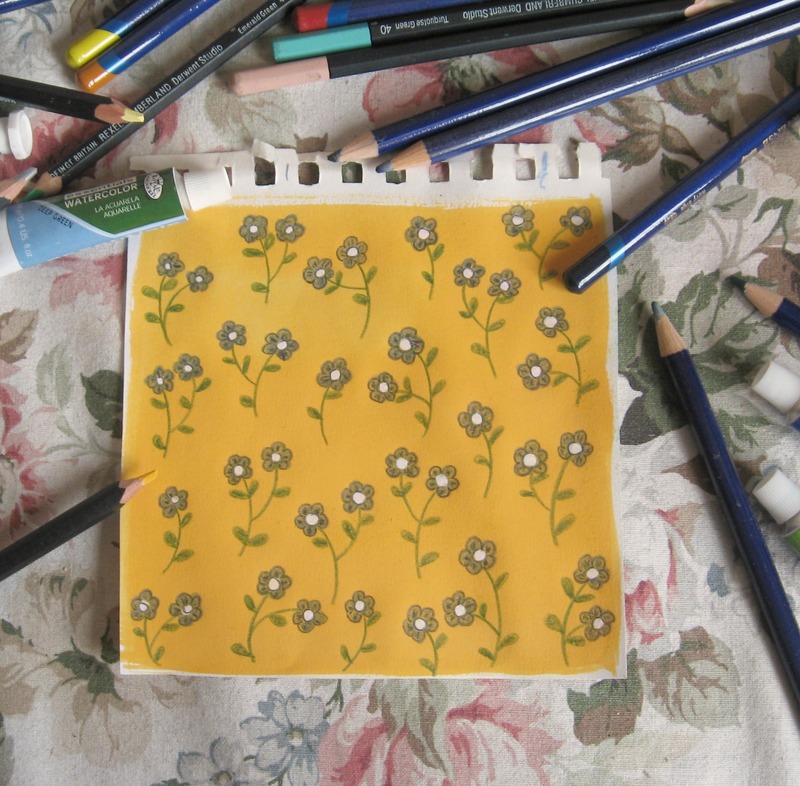 I’ve drawn the little paper stars out in two different sizes, 1 1/2 and 3 inches (this was a pretty easy to divide measurement and it allowed me to repeat the pattern a bit in my sketchbook.) 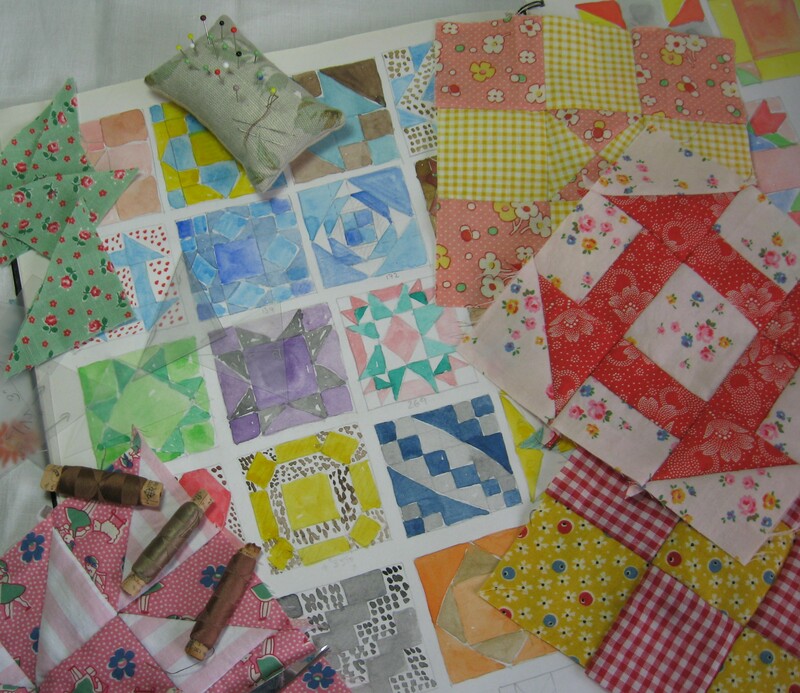 …and have cut them out of scraps of painted papers I’d left over from the previous paper quilt designs. It’s been really interesting for me to play around and try out different combinations of print and colour…and although these paper experiments have taken a bit of time, they’ve still been heaps quicker than if I’d tried sewing them. 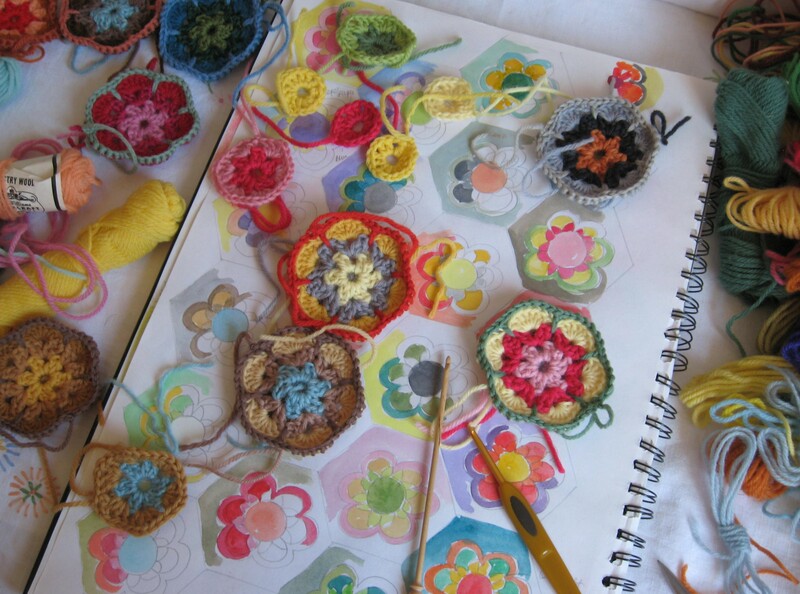 I’ve found the designs were all much easier to visualise in fabric once I’d made these little testers, they’ve been a good way in helping me decide which size to make the blocks for the patchwork…..painting them up and drawing the floral motifs has been a bit time consuming, but I’m sure it wouldn’t be hard to paint up some papers, scan them and then print them off for future use……however that is somewhat beyond my limited computer skills (and to be honest I found it quite nice and relaxing to make them…but I guess it wouldn’t be too tricky to do if you wanted to make some up for yourselves). I wanted to try out an edging, really more for curiosities sake then anything else, I’ve just used a strip of grey paper with a floral motif along the bottom…..and although I’m quite happy to not add a fancy border along the design, (and by fancy I’m meaning beautifully pieced flying geese) at the same time I find myself being drawn to the simplicity of a strip of just something to allow the main patchwork a little space, a little room to breathe. 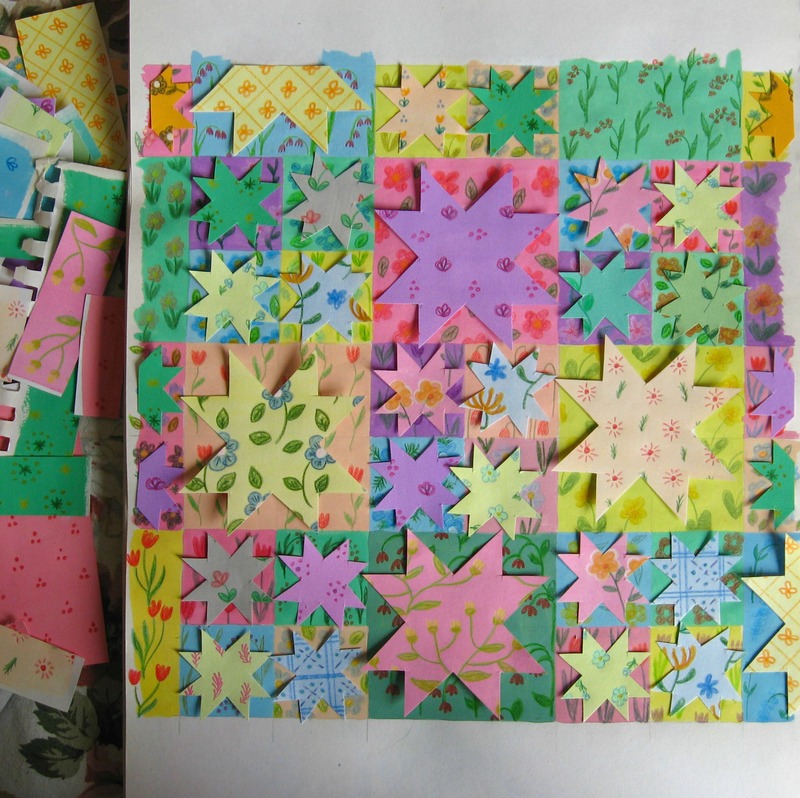 *I say “home” but really they’re all pretty much for me…..
A multitude of patchwork stars…. 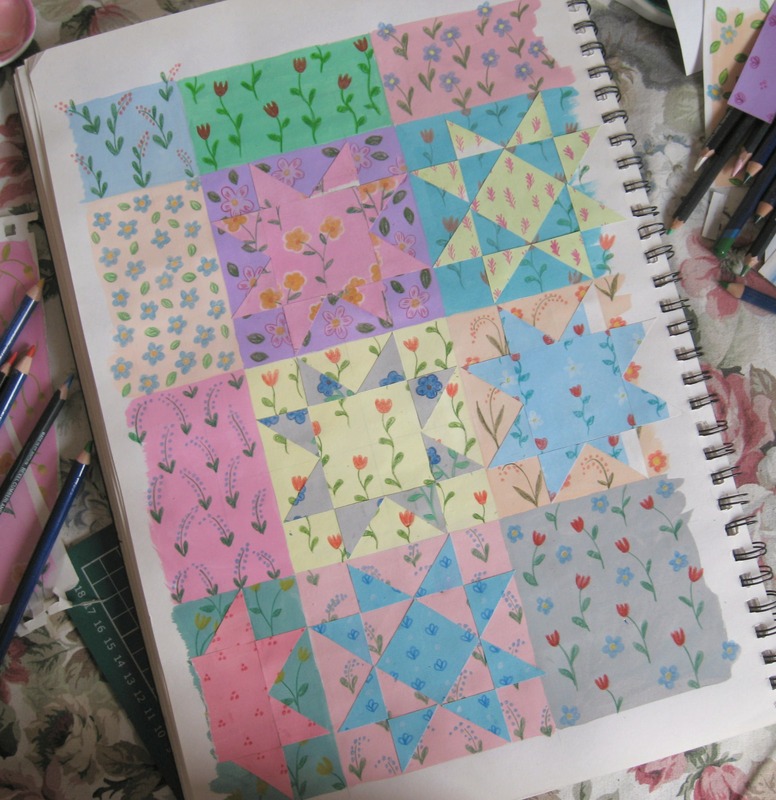 Finally after weeks of playing around with different designs and painting papers so I could visualise the patchwork a bit better I’ve finally come up with two different but similar patchwork patterns for Peggy and Pearl’s quilts. 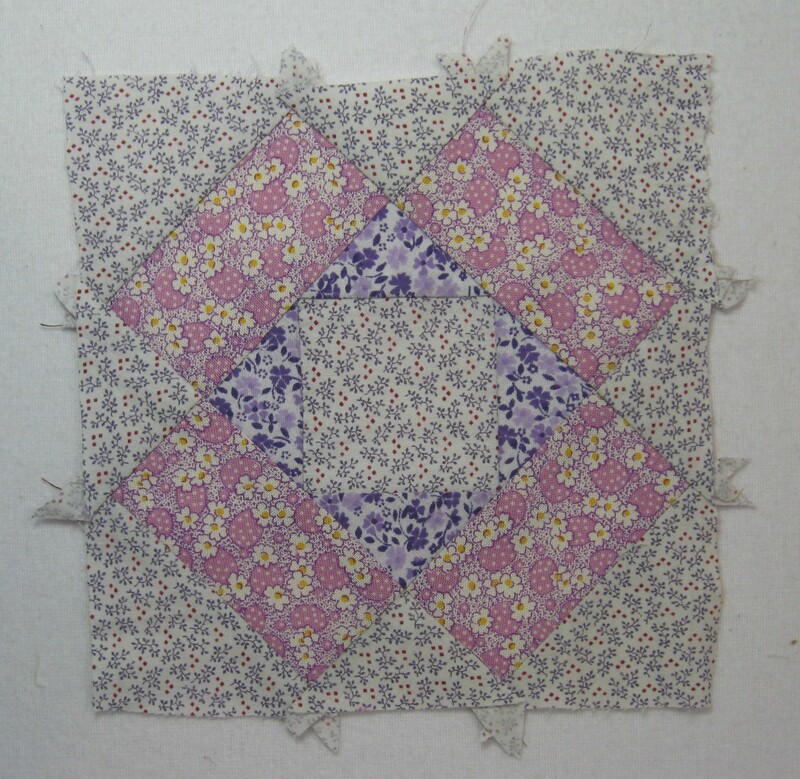 This one at the moment is called “quilt one”…it’s a mix of star blocks and will be sewn in a selection of reproduction feedsack prints……. Although their dad has left all the colour choices and overall look of the quilts up to me (which is quite as honour as these will be heirloom quality quilts which in my head will be kept and handed down to dollies if not their own teeny treasures…though I do appreciate they may well end up as cat or dog blankets), the one criteria he did say was for the quilts to look different but have something in common. 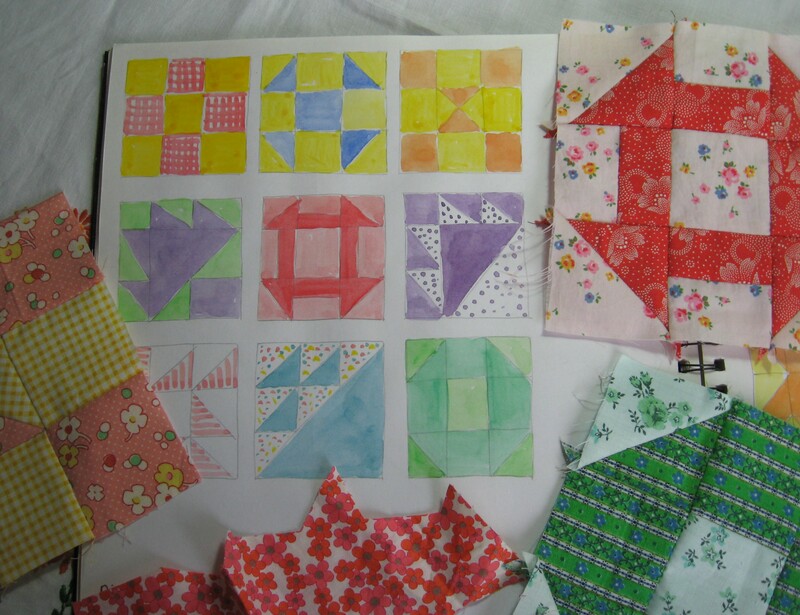 I decided the easiest way to achieve this would be to use the same fabrics for both quilts, and I’m also using a few pieces that were used in their big sister Olive’s quilt the other year….but then each quilt will also have a couple of fabrics unique to that one. Fingers crossed it will all work out okay. 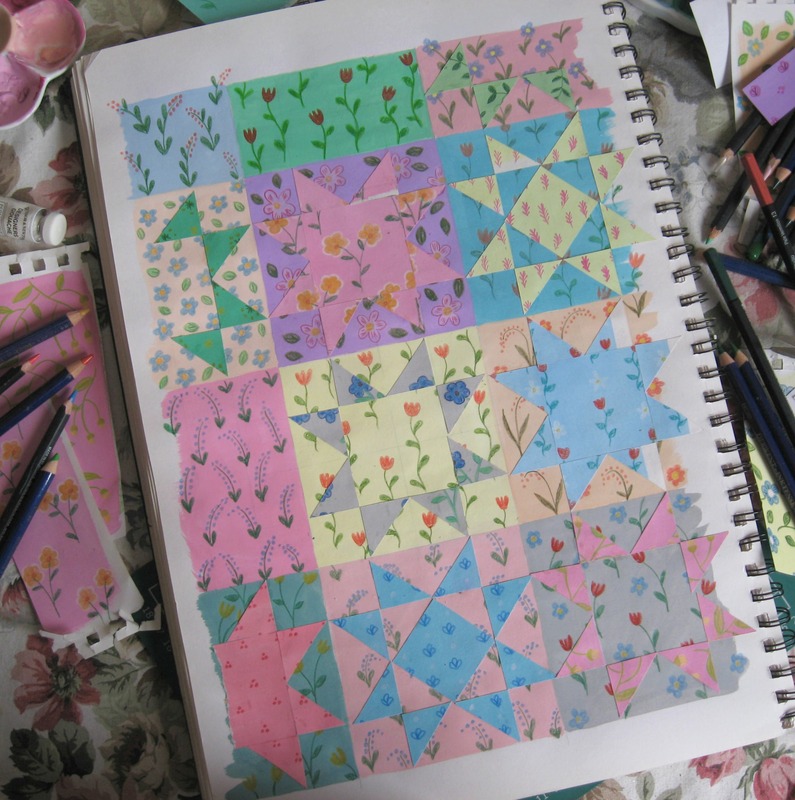 But the main motif or block repeat would also be the same or at least similar in each quilts…..
After painting up the squares (I like to use quite watery gouache paint) I then drew little floral motifs and patterns on top using a selection of colouring pencils….it’s a bit pfaffy and fiddly but also very relaxing and nice to do. 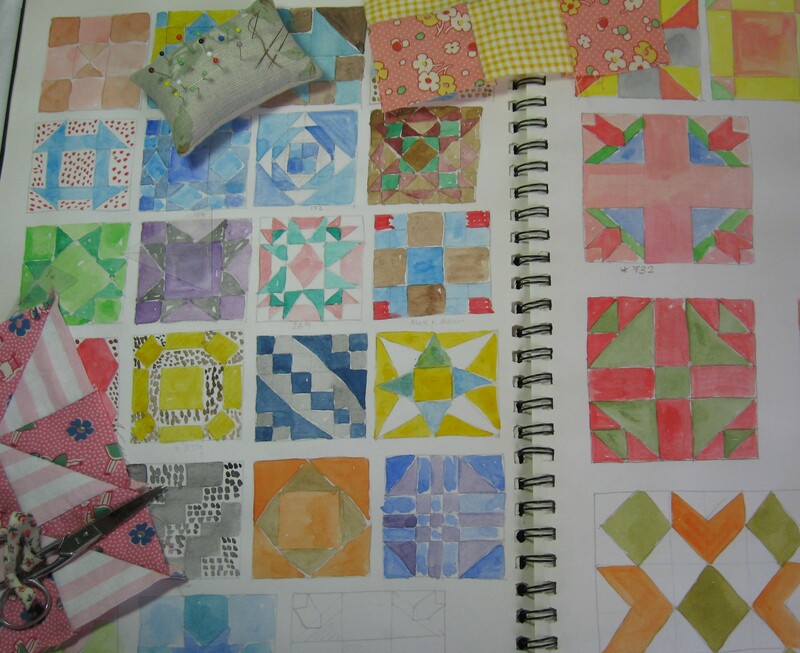 This method of working really helped me see the patchwork designs better, and I was able to draw out the quilts that were there in my head. 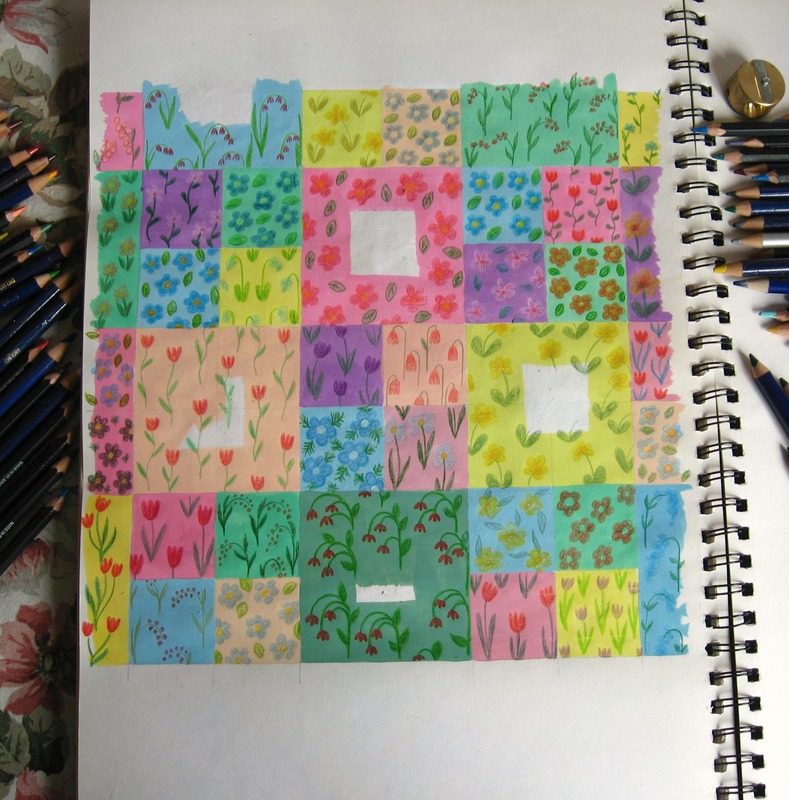 I really like how pretty this looks once all the little squares have been decorated…..this is probably a bit more fanciful than what was required but to be honest I just liked doing it. Then the pre-painted papers from a couple of days ago were cut and glued (I used mod podge glue as that sticks to pretty much anything) and arranged into place. Rather than use the same star block over and over again I decided to use three different variations of the same basic 8 pointed star. 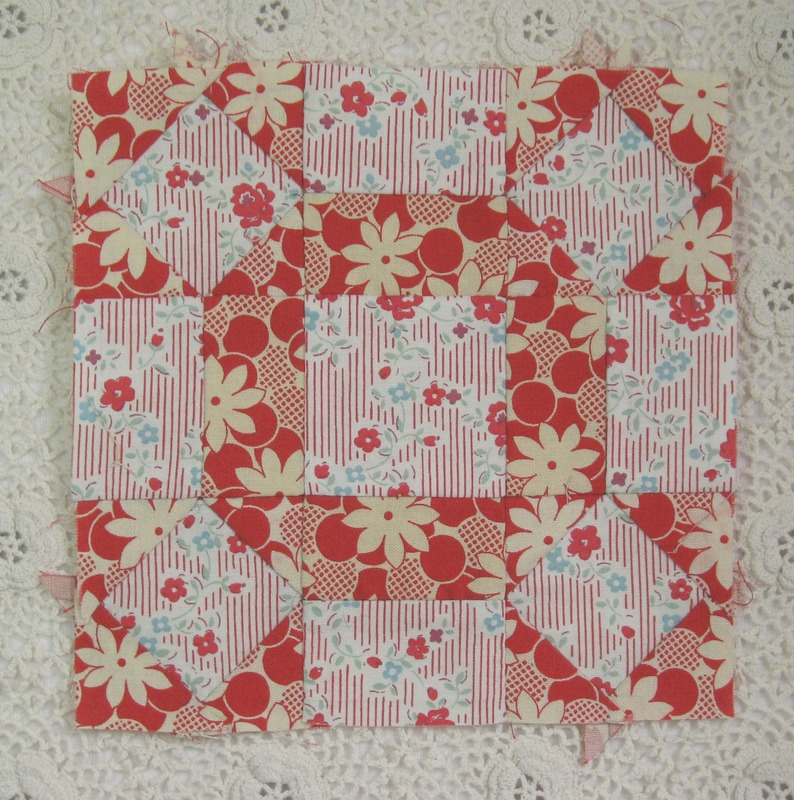 I’d already made little six inch blocks of each one for “dear ethel” and they sew together really nicely. 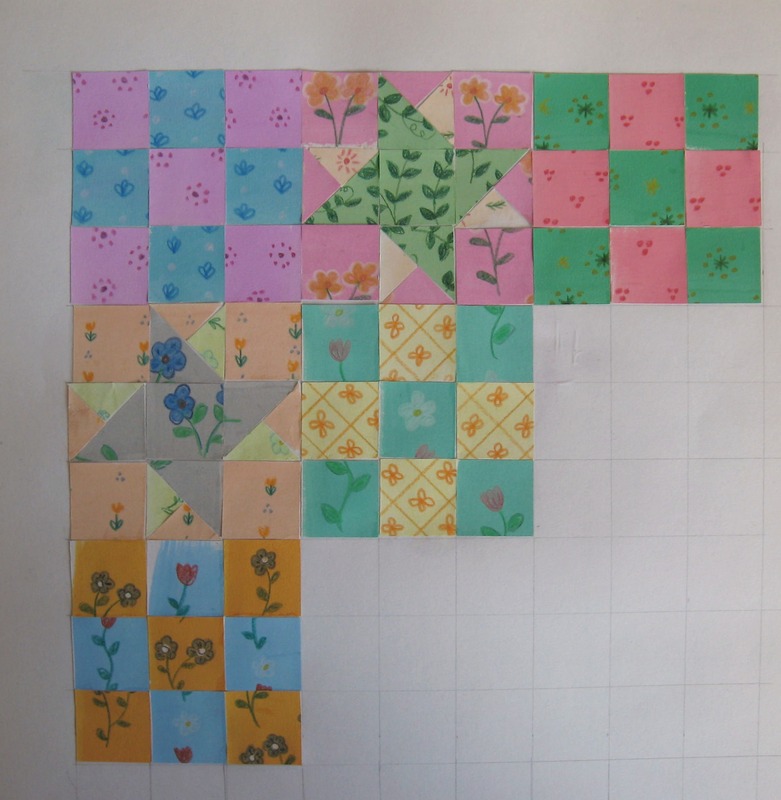 Also using blocks of the same division means the patchwork won’t have any weirdly placed seams. Olive’s Quilt was about 30 inches by 42 inches and I’m making the ones for her new sisters the same size…..Crystal star is a bit of a fiddly block so I’ve decided to make this quilt with blocks 10 inches wide (12 in all)…that way the fiddley blocks won’t take me forever to sew up…I’ll probably need to sew an inch wide strip for a border once the patchwork is completed but I’ll wait ’til that is sewn before a final colour choice at this stage….then once all the patchwork has been sewn by hand there’ll be lots of hand quilting on top. 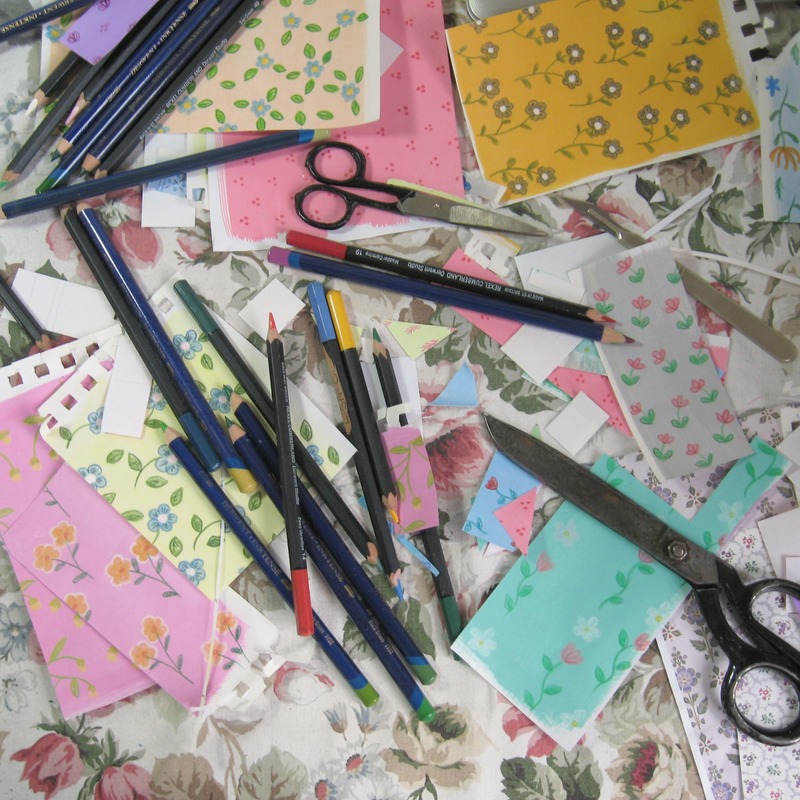 I had a lovely comment recently about being so organised…..which made me laugh as I am very messy worker….I leave little piles of papers or fabric or wool wherever I’m working or when I move to a different seat …this is just part of my sewing table at the moment, covered in tiny snippings and snippets of painted papers…for once there isn’t a big fat cat sprawled out over it all. 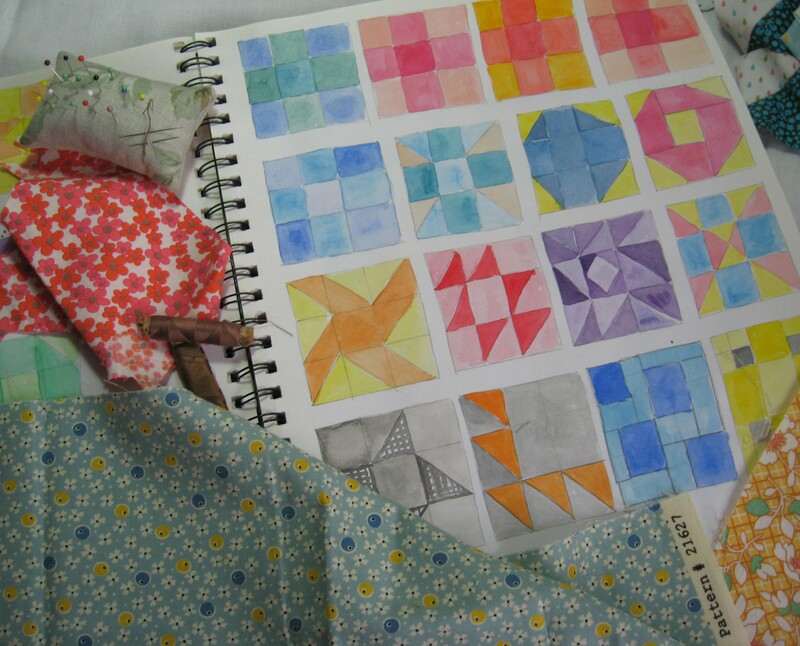 Quilt two will be tomorrow……. 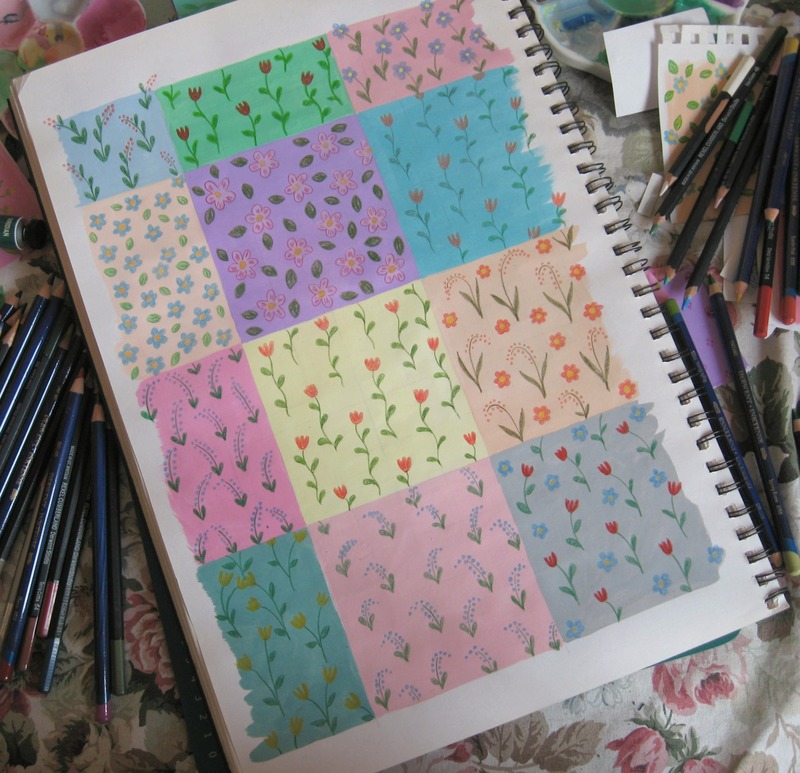 As I mentioned a few days ago I’ve been painting up papers to help me plan out the patchwork blocks for the quilt commission….. with hindsight it may have helped more if I’d reproduced the fabrics that I had seen and thought yes to, however I quite liked just painting and colouring while listening to some quietly playing music in the background. For the backgrounds I used water downed gouache paint and then worked motifs and patterns on top with a variety of colouring pencils……when I was painting up some of the patchwork block patterns I felt some of the patterns were looking a bit flat and then I realised it was probably because I’d painted them with plain areas of colour, and generally all my patchwork tends to be sewn using lots of prints. 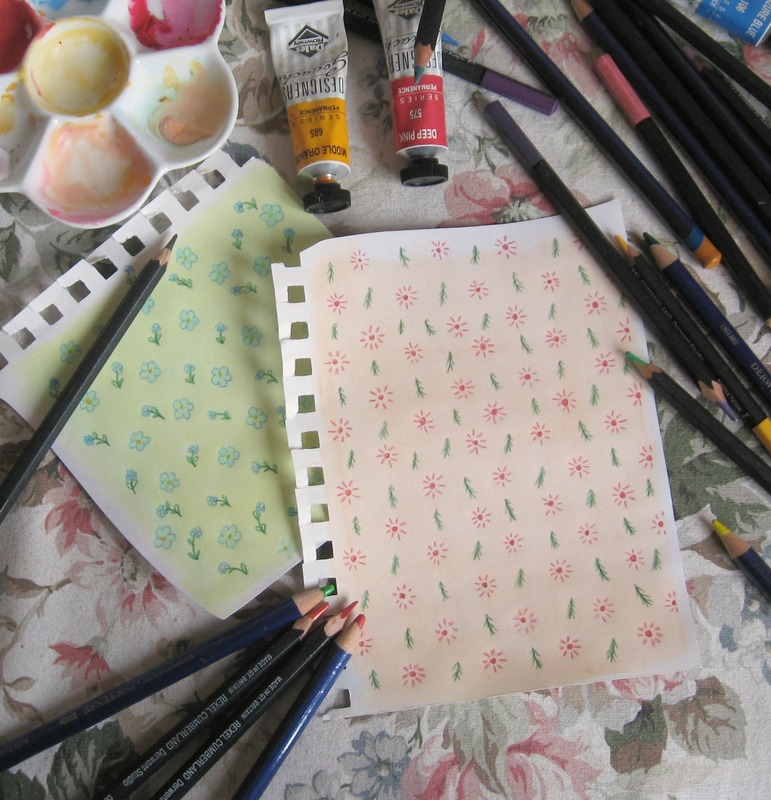 I also found myself repeating the same block pattern and feeling a little bit like I was stuck in a rut and somewhat daunted by the scope of the patterns and colours available, having a little break (and painting up papers) my mind seemed to be able to wander about quite happily and new ideas began to form. 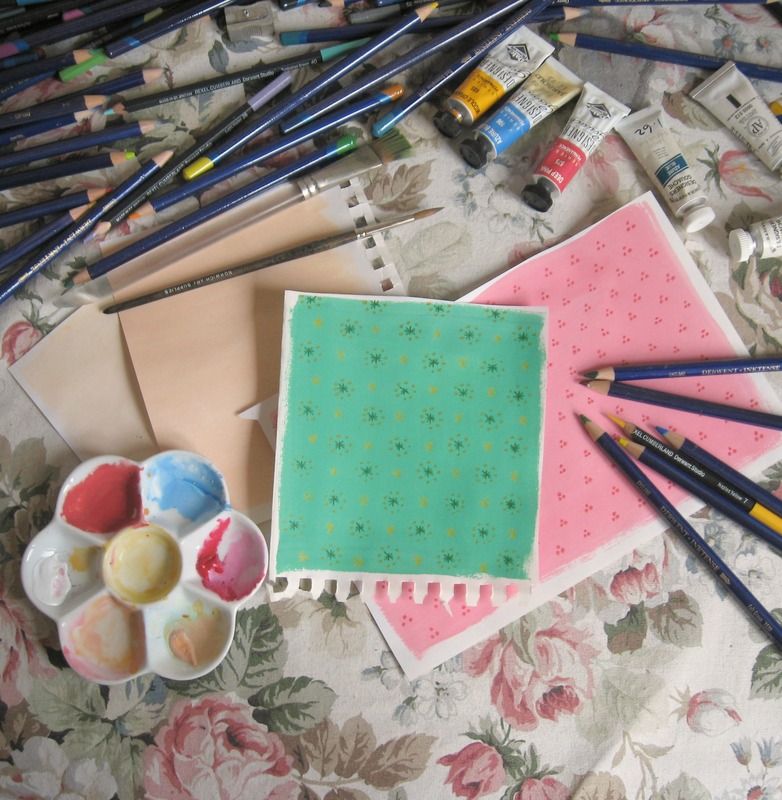 I was really inspired to paint up some papers to help with my patchwork planning after seeing some papers that Phoebe Wahl had painted and cut out to make her beautiful collages…Phoebe is one of my favourite illustrators and I love her work so much…she captures those lovely quiet moments of everyday life that we all know and which seem to pass by so quickly but which remain in memories….she also does the best illustrations of textiles and quilts so thought this technique would be perfect for helping me cope with the jumble of ideas that was going on in my head. 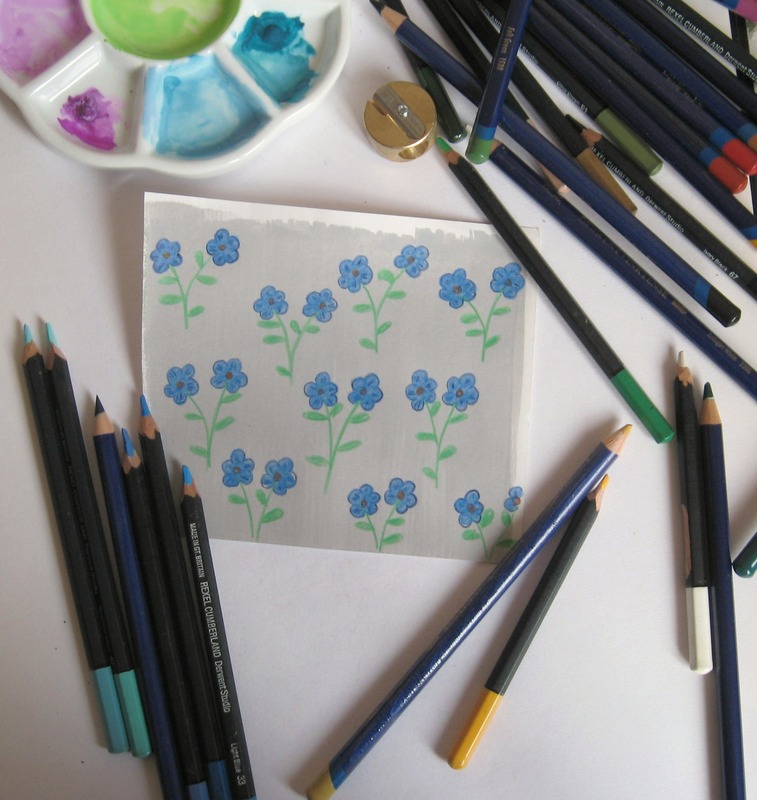 I’ve ended up painting nearly two dozen different little prints in a variety of colours and different sizes, the floral prints are my favourite but I then like floral prints in fabric. 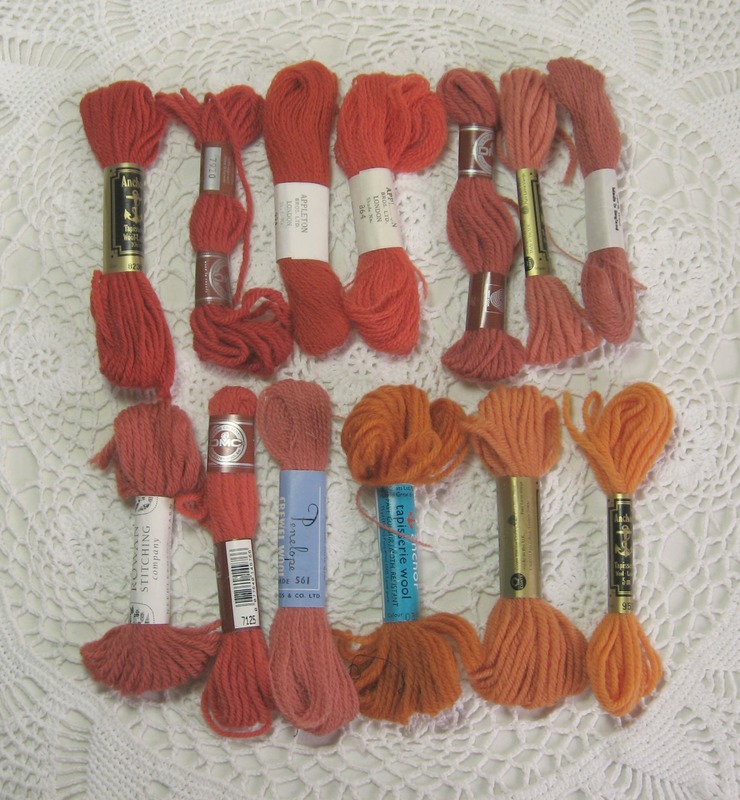 Favourite fabrics are the feedsack reproduction style ones which have been really popular over the last some years. Though I like fifties style dresses I much prefer the fabrics from the thirties and favour a slightly more subdued palette (though I appreciate that when these fabrics were new they were a lot brighter than what we see today.) 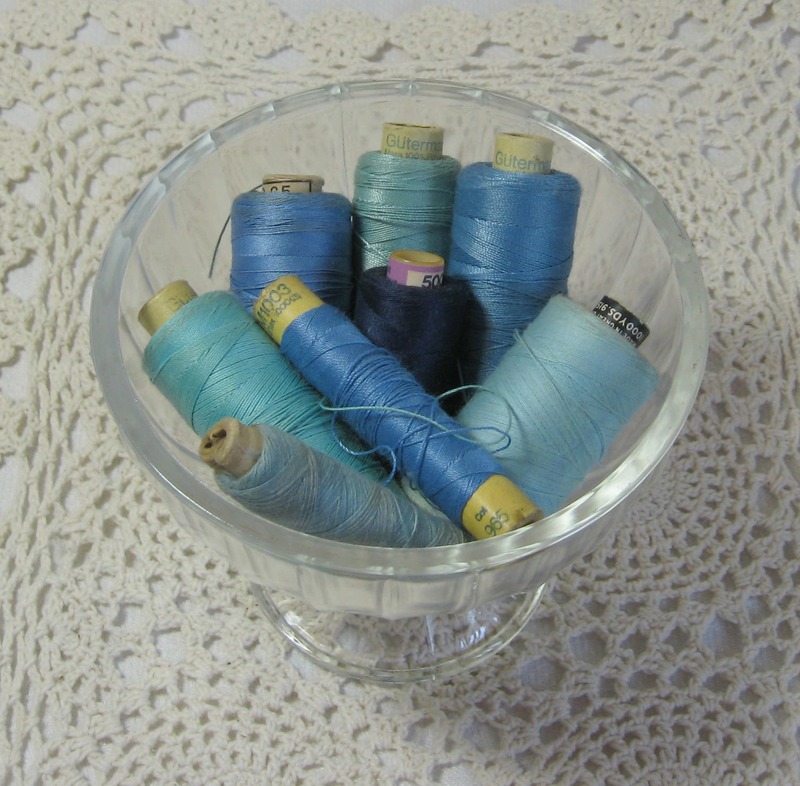 I’m all for sun faded and time softened fabrics and find my patchwork choices reflect this. 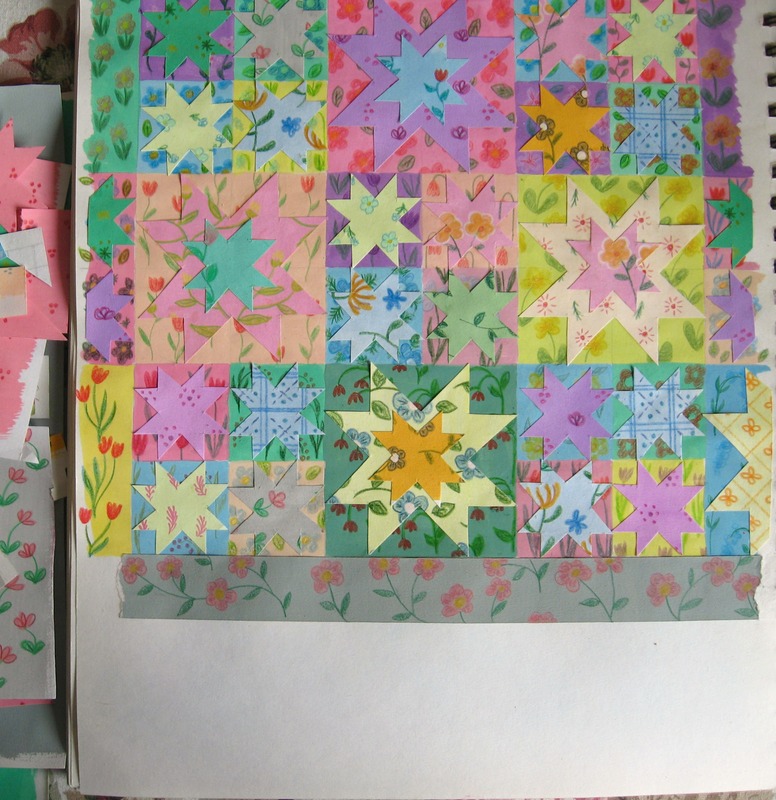 This is a somewhat different way of working to when I was making the blocks for “dear ethel”….partly because that quilt is for me so I only had myself to please, where as a commission you are trying to please someone else, even harder this time was that the quilts are a surprise from “dad” and I have to try and remember which colours “mum” liked when I made them a quilt before. Spending tme painting up papers, and colouring in blocks has meant the design process has lasted longer than I thought but it has helped me clear out “head clutter” like you wouldn’t believe, and has also made me think about and consider designs that I hadn’t even thought of when I was just colouring in a flat area of colour. 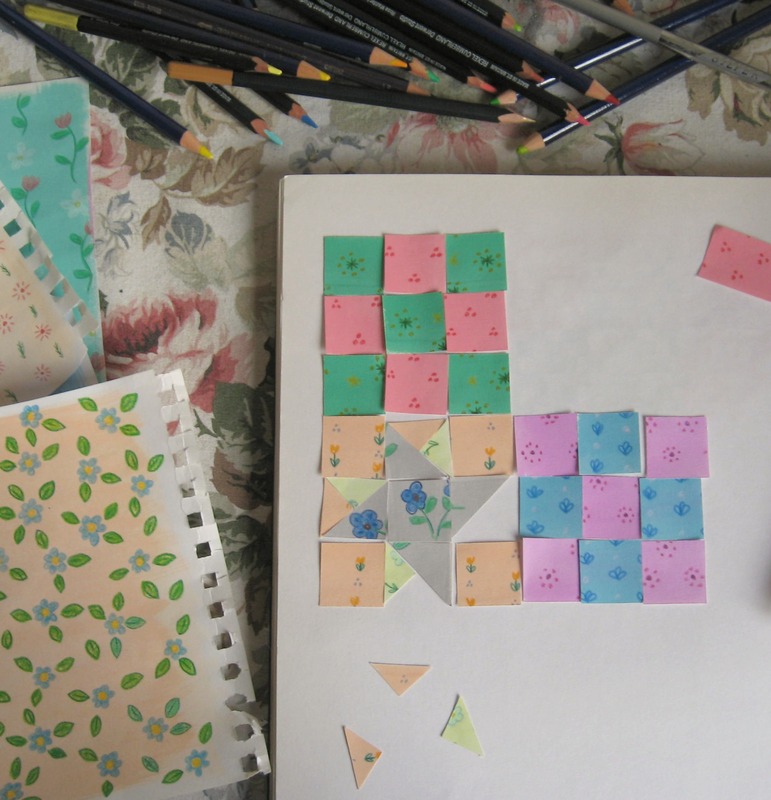 Now I’ve got a good old selection of “prints” I’ve started cutting them up to arrange into little paper patchwork blocks…these little squares are only an inch wide. 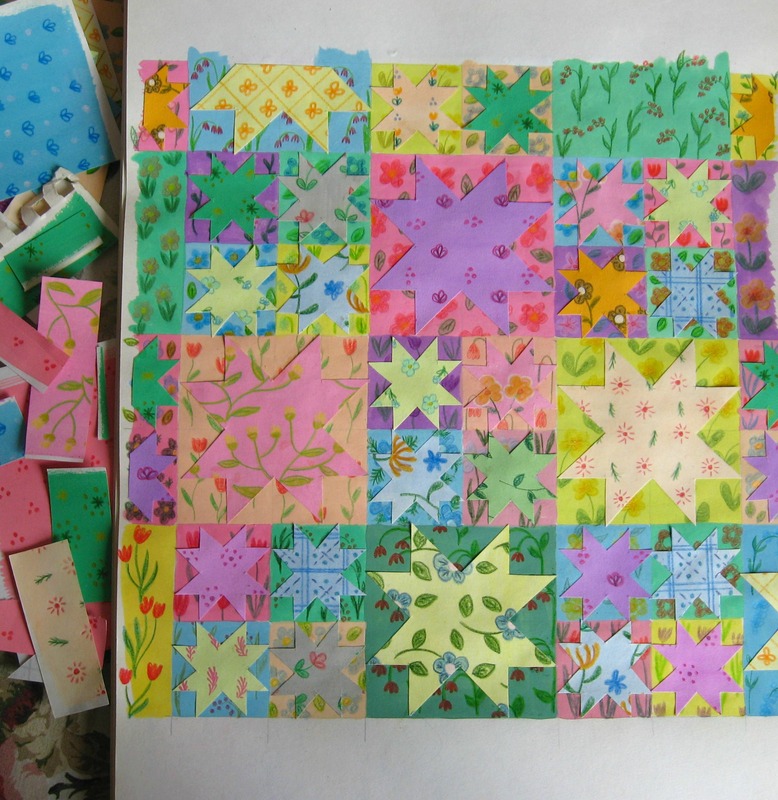 The blocks for “dear ethel” are six inches wide and one idea I thought about while cutting out the papers was to make the blocks for these quilts the same size as that, however that is going to take me quite a while, so I’m thinking that one solution would be to use six inch squares of patterned fabric every other block…..but then again I could just up-scale all the blocks, and make them ten inches wide instead. This is a mix of two different blocks, a very simple nine patch block and then “twin star” which I thought most apt as these designs are for quilts for twins. 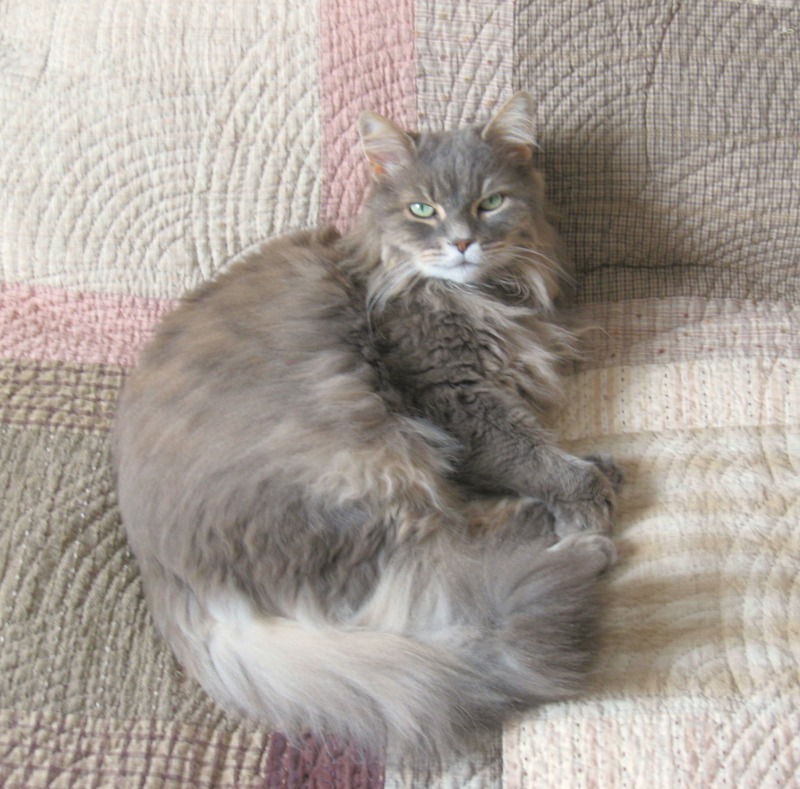 One thing their dad did ask for was that the quilts are to to be different from each other. 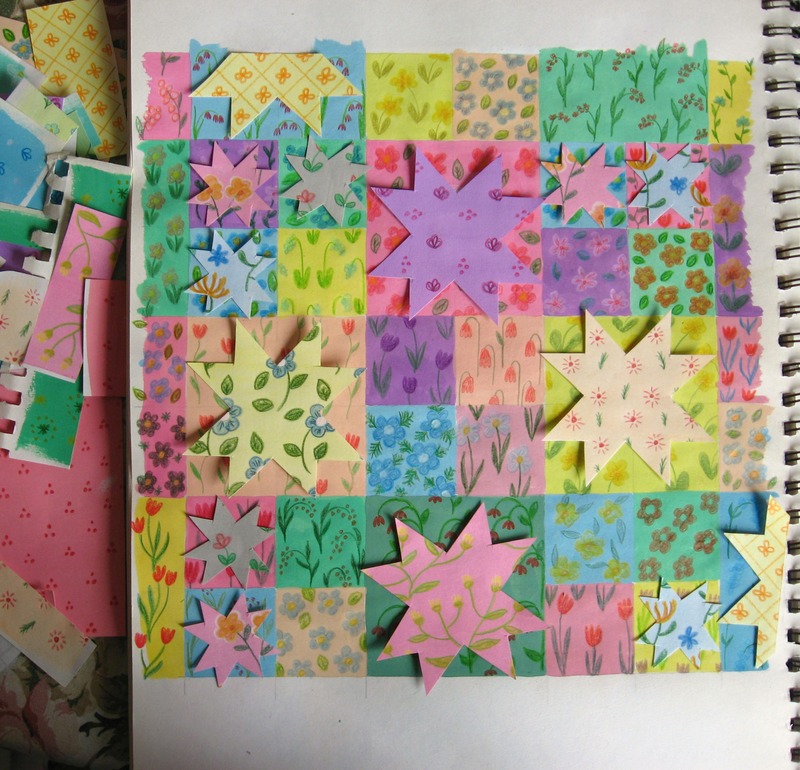 I’d played about with using the same block but to use it differently, using other blocks around it or setting it out out on the diagonal…..
I’m thinking it would work even better if the stars were made from just yellow and orange fabric, then they’d stand out really well. 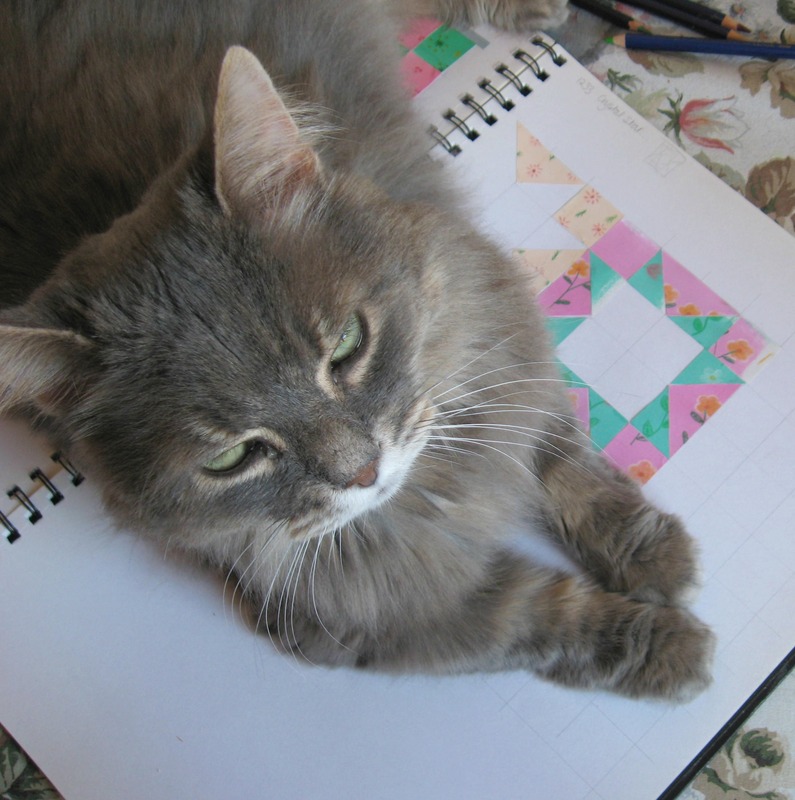 Both quilts will have lots of hand quilting so seam lines and colour edges will be softened and blended. And of course the inevitable happened, I popped down stairs to put the kettle on, came back up with a pot of tea and found the “supervisor” inspecting what Id done….the floor was covered in small pieces of carefully laid out papers, and even tinier pieces were found stuck to his tummy where he’d stretched out on the sketchbook and some sticky scraps. When I went to move him there was a trumpety sound form the musical bottom and a bit of a whiff so decided to take a tea break downstairs. 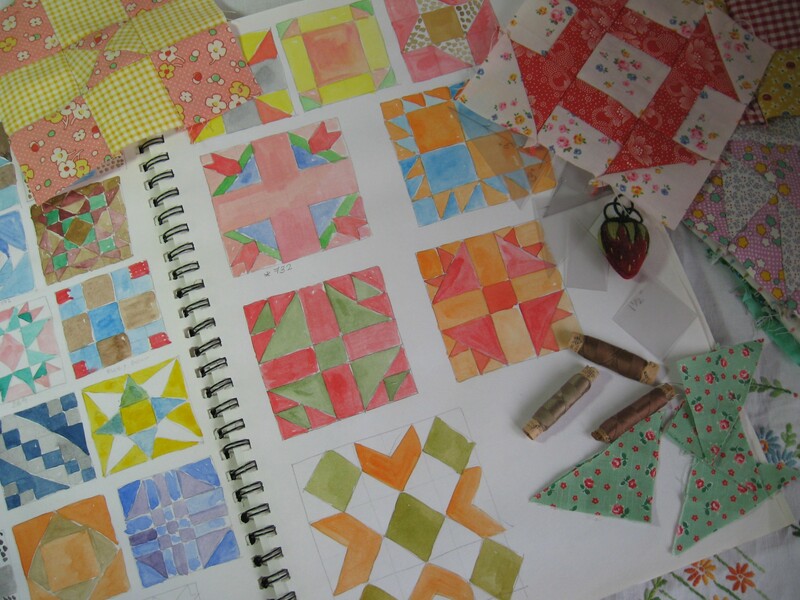 Slowly but surely ideas for the quilts are coming together, I always find it easiest to play out in a sketchbook first, trying out ideas and colour schemes….it’s never the same as working with fabric but it gives me a chance to jot down first thoughts…random ideas that may or may not come to anything….. Working in this way isn’t for everyone but I find it quite relaxing, and can zone out somewhat, half listening to something soft and mellow in the background and just spread out paints and colouring pencils around me on my work table, a pot of tea at my elbow……something I’m very aware of though is that I much prefer to work with fabrics with prints rather than with plain colours. 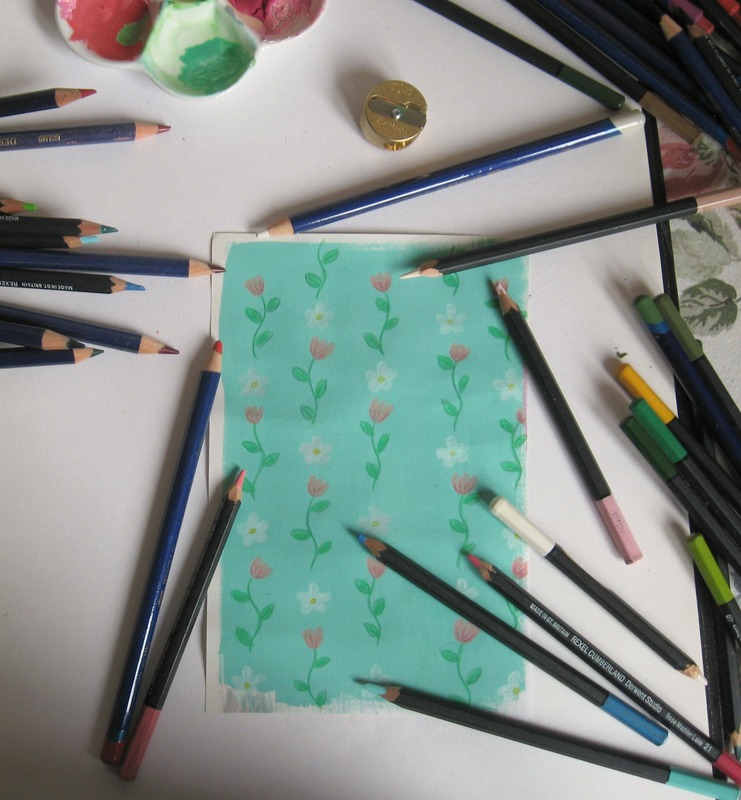 It’s quite hard to get a sense of what a pattern will work like when it’s just painted with one colour, but then I remembered seeing pictures on Phoebe Wahl’s instagram of her printing up and painting pages of texture and colour all ready to cut out to use in her beautiful collages….I love her work so much and she is easily my favourite illustrator of quilts…they always look so soft and handmade, whether they are hanging out for an air on a washing line or keeping children on sledges warm, or being sewn ….one of my favourite pictures of hers is this one…(actually this is probably one of my favourite pictures in the whole world ever)…who wouldn’t want a cosy bed like that….. 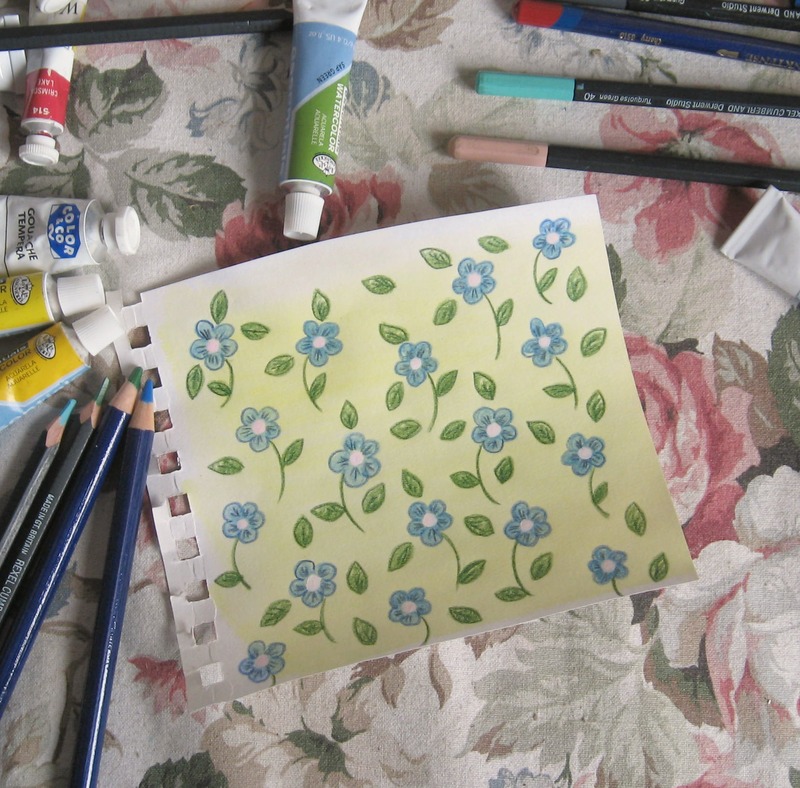 So being totally and utterly inspired by Phoebe I’ve been painting up papers (nothing fancy, just cheap cartridge paper from a local art supplies shop) with watercolour and gouache, then once it’s dry I’ve been working on top drawing out little motifs and patterns pretty randomly……if I’d had more sense then I’d have tried to illustrate pictures of fabrics I’ve noted I have liked, but then I’ve quite liked just drawing freely…. 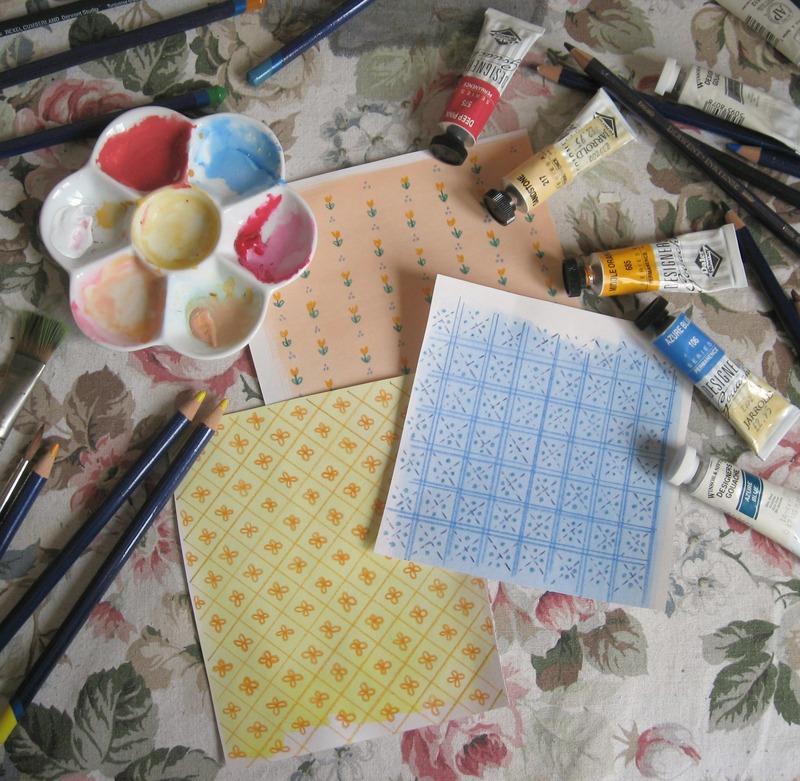 I’ve painted up a selection of papers, maybe 15 or so in a variety of patterns and colours, and plan to start cutting them up to make little quilt collages as soon as they’re all dry. If you’re at all interested, you can in fact buy a whole range of fabrics from Spoonflower which is printed using some of Phoebe’s beautiful designs. 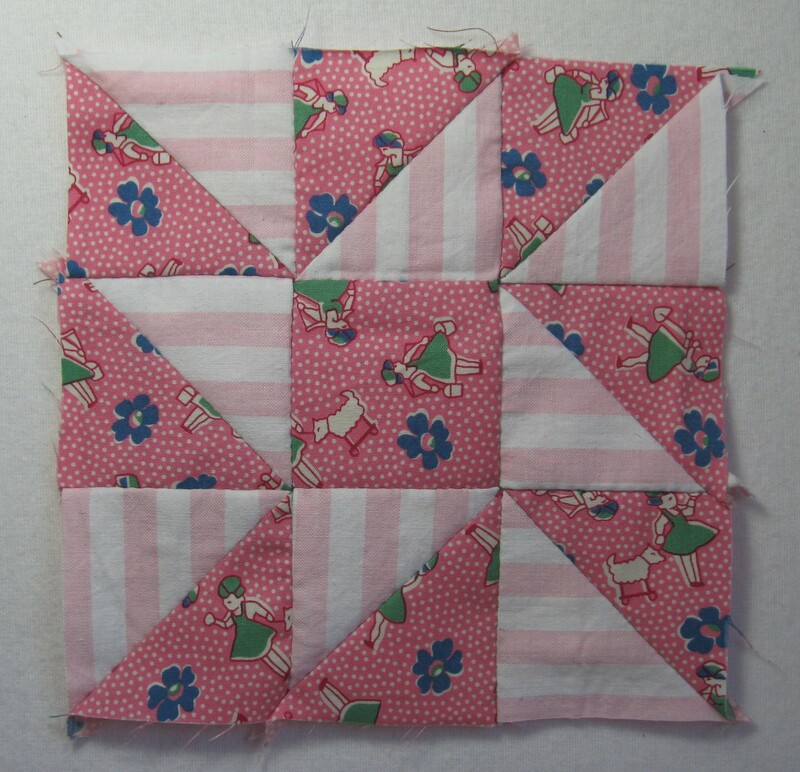 Her fairy fabric is just adorable and I’d love to buy some in every colour for a whole series of fairy tale dresses…..
I’m really enjoying sewing these little blocks. 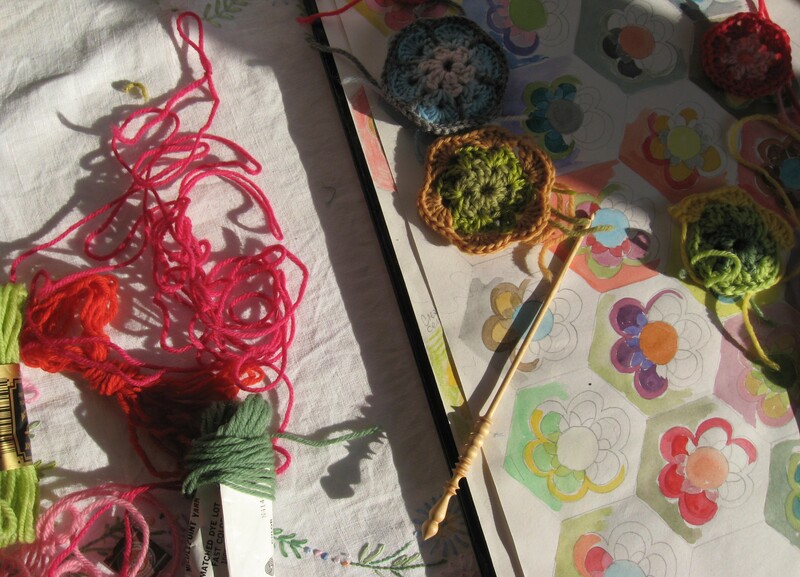 At the moment my sewing table seems to be a riot of colour with open sketchbooks and stacks of brightly sewn blocks of fabric. 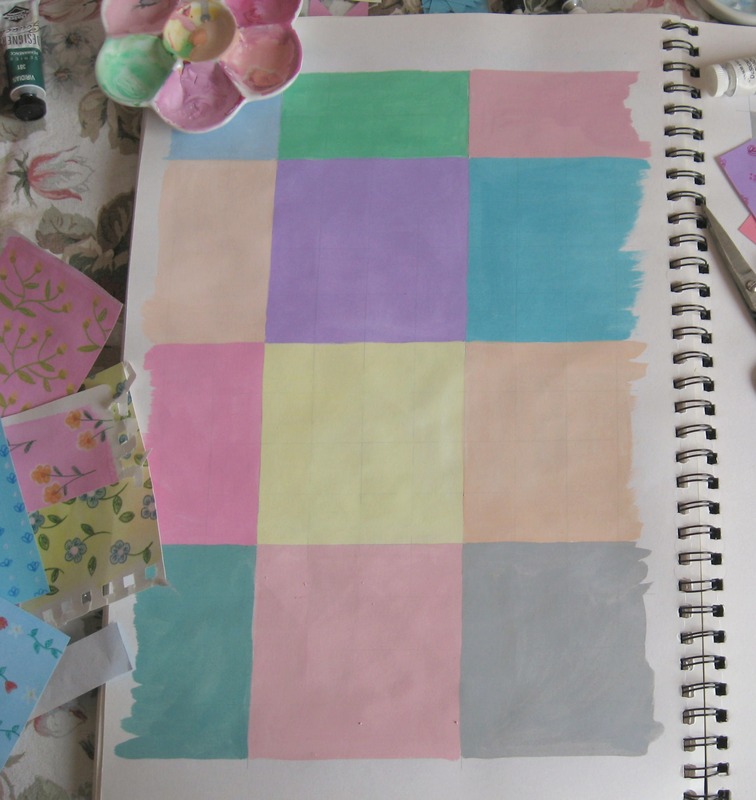 Before I start randomly cutting out patchwork shapes, I draw out which blocks I find most appealing in a sketchbook where I then play about with colour to see which combinations work better. Drawing out the blocks a bit ahead of myself helps me not to sew up the same block twice. I’m trying to stick to Nine patch blocks (there are over 1000 different nine patch blocks so I’m not really limiting my choice). 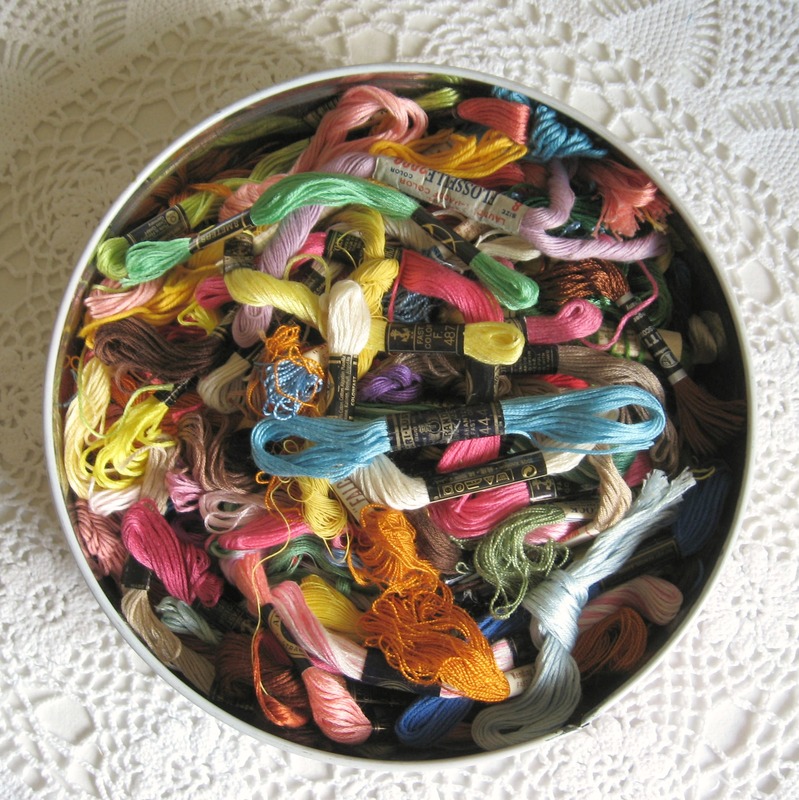 But it also helps me think about which combinations of colour I enjoy working with and why, and also is an easy way to try out combinations I wouldn’t turn to as a first choice. I liked the combination of orange and grey but when it came to cutting it out in fabric, it didn’t suit that particular block, so I used those colours together in a different pattern, and plan to make that block now in a grey fabric and a black/white patterned one. 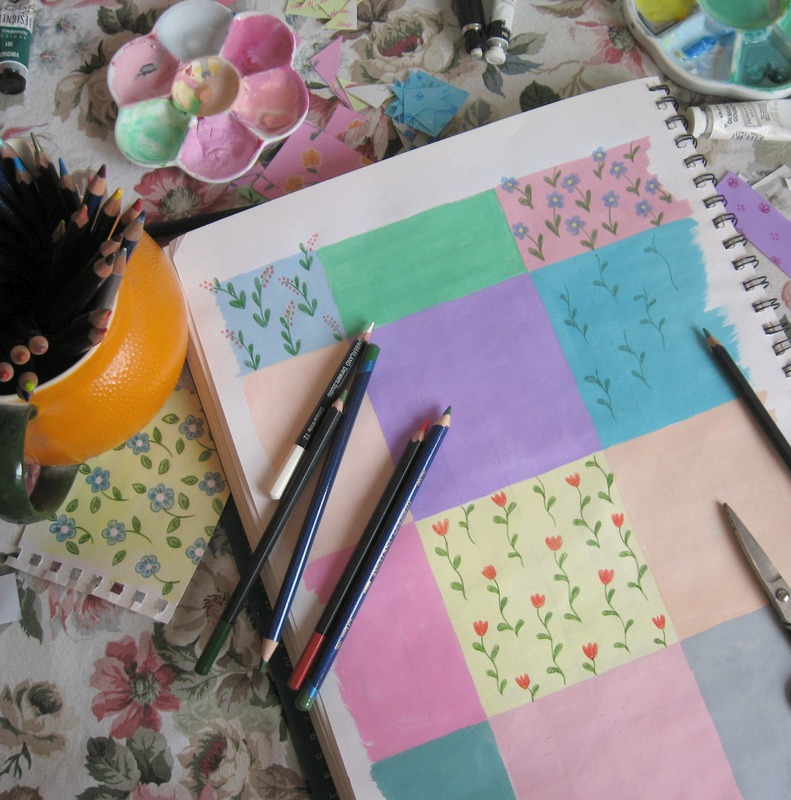 It’s interesting for me to see how the drawn painted block then turns out in fabric. Originally I’d wanted this quilt to be blocks of plain American muslin and then one colour, but actually I’m really happy that the blocks have become their own little colour party. 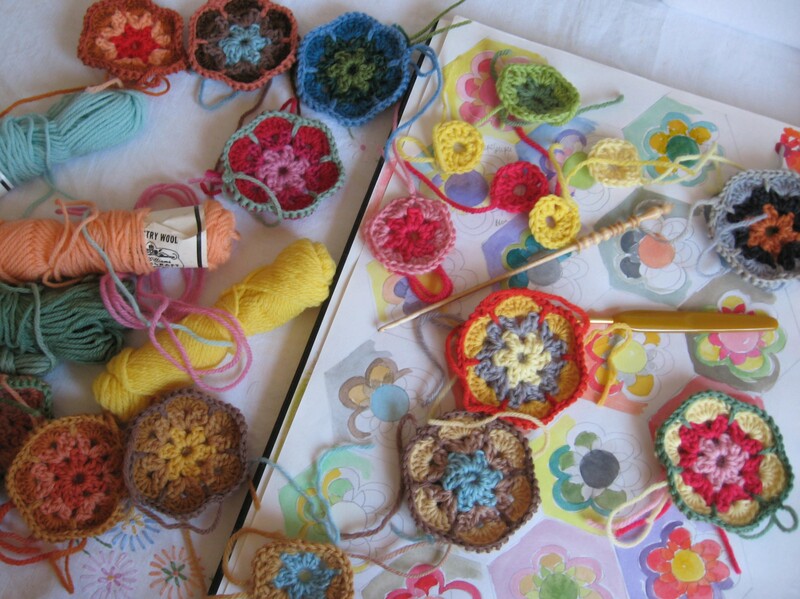 Last week I was showing a friend the Grannie’s Paperweight blanket, we spread it out on the carpet and she said that she couldn’t believe the amount of jewel-box like colour the blanket had. She asked me how I had put the colours together and mostly I play about with the tapestry wool to see which colour way compliments another. 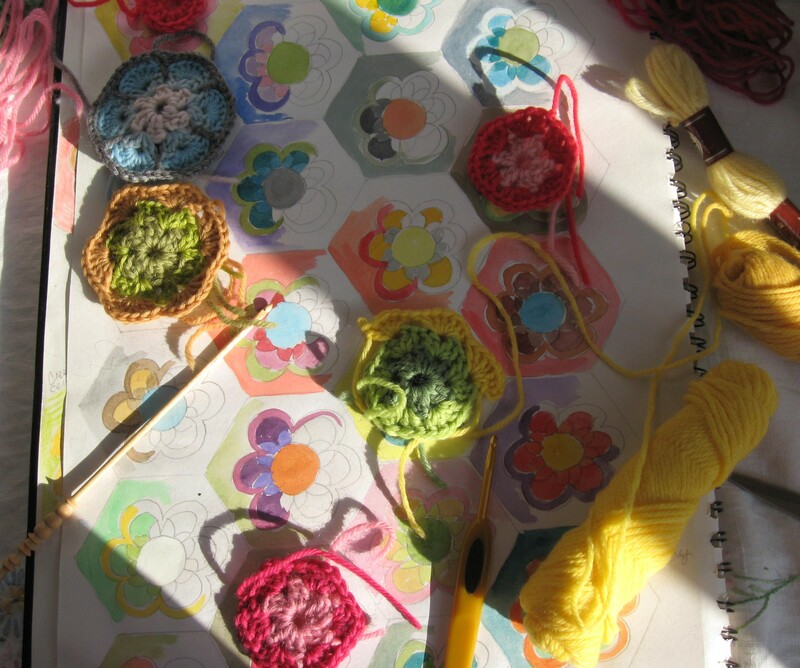 But I also paint up a few hexagons first in a sketchbook, sometimes I reproduce the colours that I’ve seen together on a piece of fabric or in a print or painting. 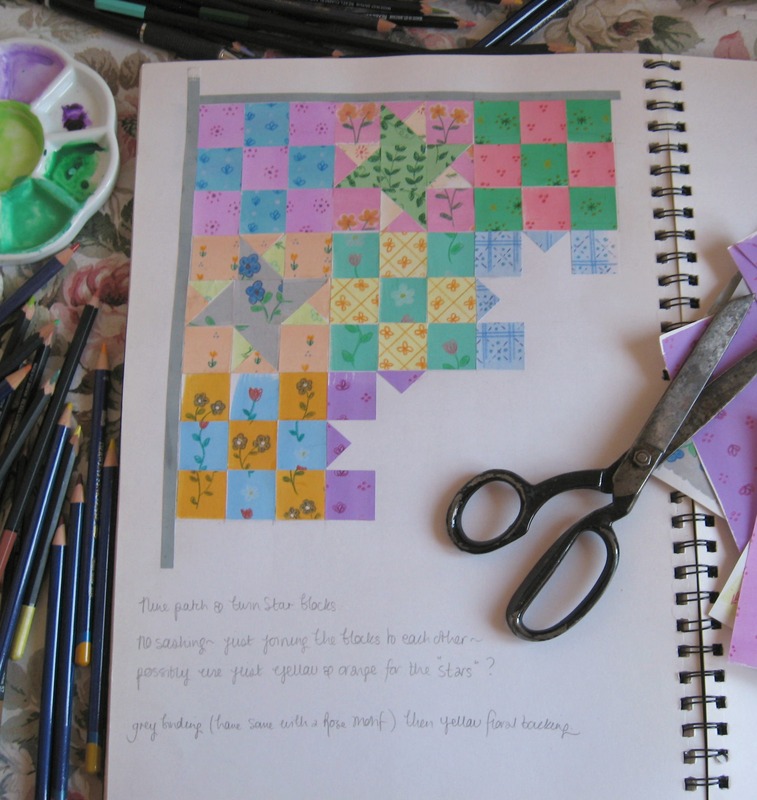 This is also how I work when I’m designing patchwork for a quilt, often trying out umpteen different variations on a particular colour scheme for each block. Sometimes I play around with just the wool or the fabric, but it’s also nice to just play with the paint and see where that takes me. 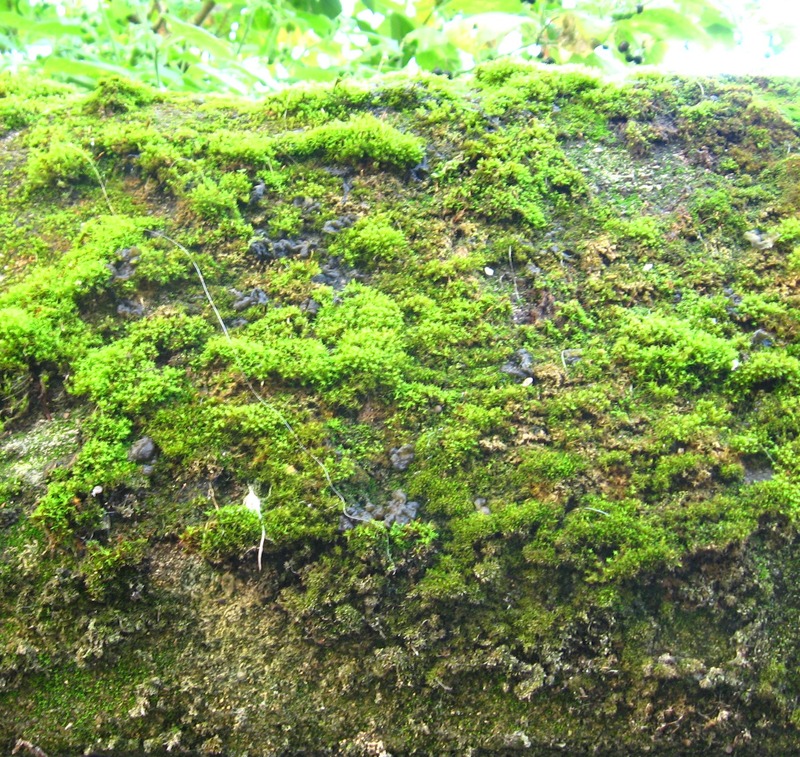 If I’ve woken early and no-one else is up I try to work quietly in my studio , my desk is dappled with first light shadows which by mid morning have gone. 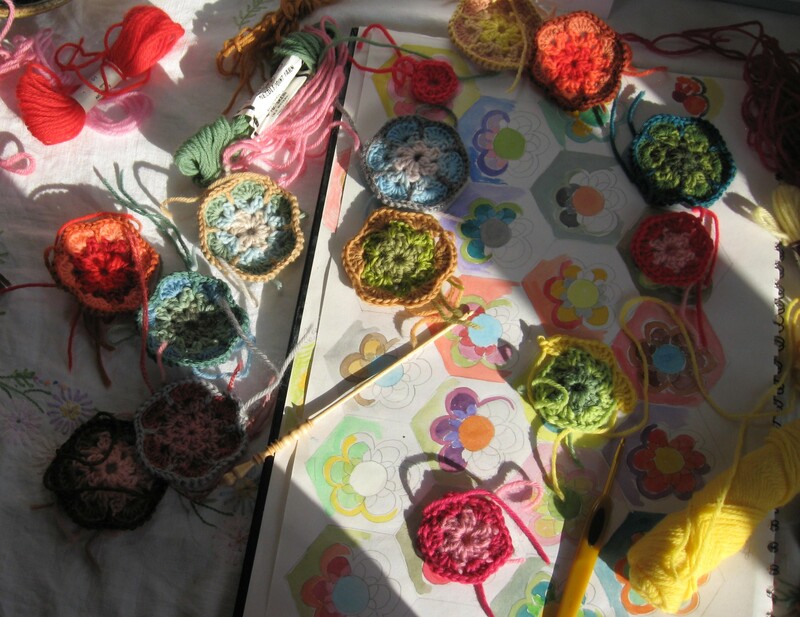 Using tapestry wool for this type of crochet pattern allows me to play about with an incredible variety of shades and tones of any one colour. 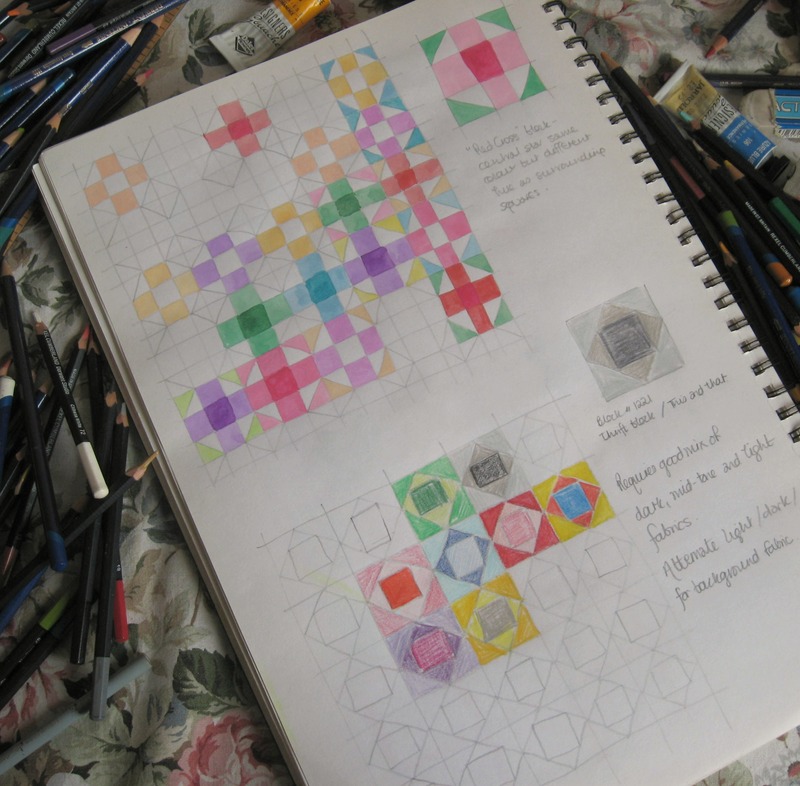 This helps me to keep each hexagon looking different. 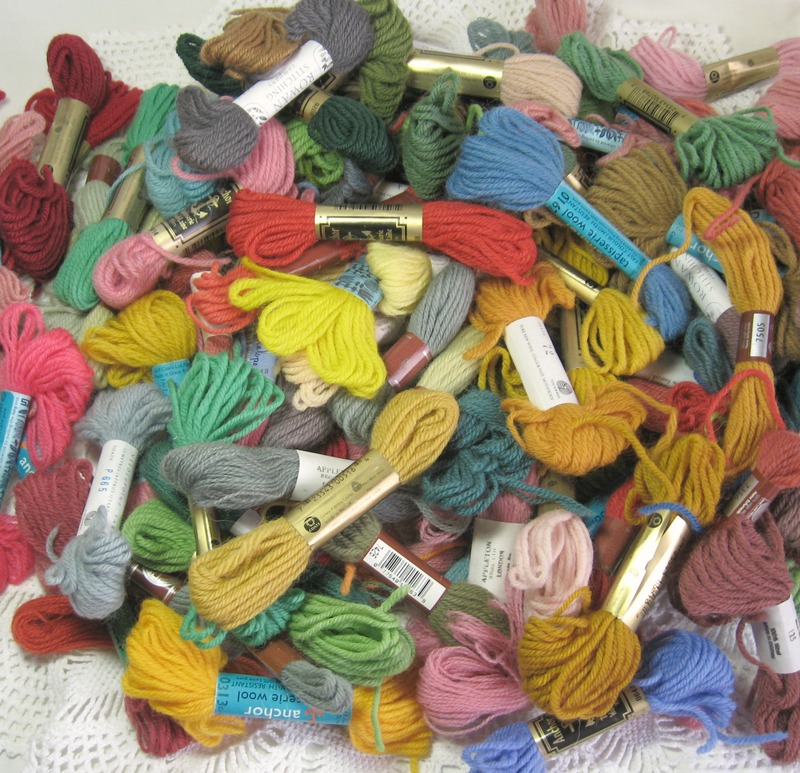 But I think using wool also allows the colours to blend together really well. 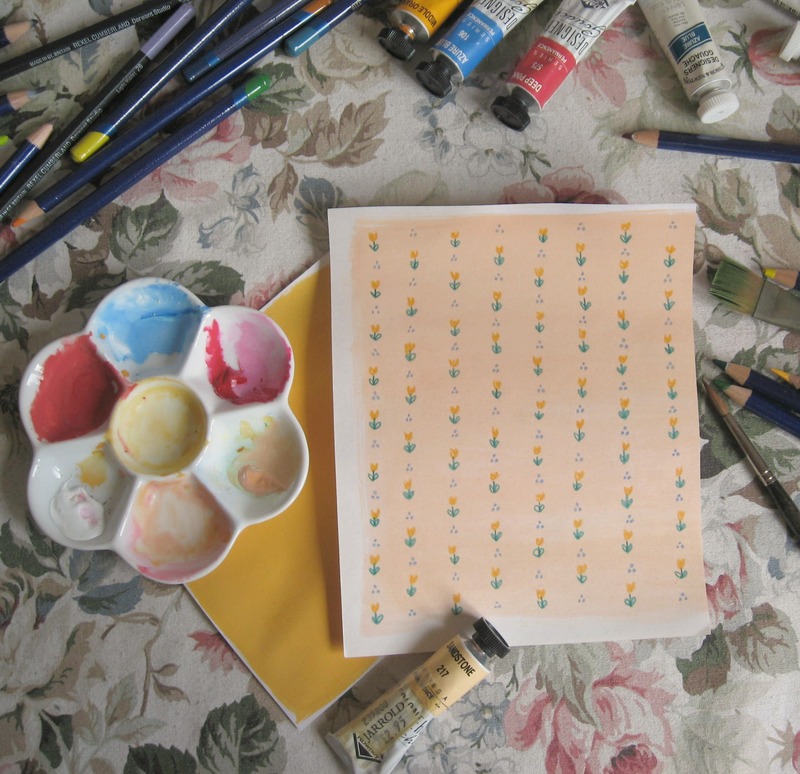 I know I have favourite colour combinations and I have to stop myself constantly wanting to mix yellows… the lemony, custardy colours with cream, and I love teal and apricot together too, so I try not to make too many of those. I think painting down some other colour combinations helps me to steer away from groups of colour that I’m more naturally drawn to.